Mummies and deadies, boos and ghouls! Creep over to Newport for tricks, treats, games and activities for the whole family! Each year, Newport Parks & Recreation and a group of local organizations combine powers to host an Annual Monster Bash party on the Saturday before Halloween. Parents and children are invited to meet at the Great Pumpkin gazebo near Gardner Park at 12:30pm for a haunting parade along the bike path and Main Street. Kids participating in this goulish fashion show will be entered in the annual costume contest for a chance to win the cutest, creepiest or most creative in town! For a chance to be named for this year's best, don't forget to strut your stuff as you pass by the judge's station in Pomerleau Park. Winners are announced at 2:00PM in the Municipal Gym. A group of Monster Merchants on Main Street are excited to haunt with all the ghosts, ghouls and goblins scaring about town for the Monster Bash! During event hours from 1:00-3:00PM, visit any merchant with a "Trick-or-Treat" sign in the window for something sweet, a game or even a Halloween craft! Help support this event by donating to the Halloween Candy Drop. Hay wagon rides pick-up periodically at the Municipal Building parking lot for free loops around the waterfront during the event. Northeast Kingdom Car Club is based out of Newport and geared toward the younger generation of car enthusiast. Each year they organize local meets and race events at tracks all over New England. During Monster Bash, members gather to show off their cars with a festive Trunk-or-Treat event in the Municipal Building Parking lot. Following the Ghost Walk costume parade, join us in the Newport Municipal Gym for spooktacular games like Monster Match, Witch Pitch and Give Frank a Heart! Most activities are geared toward children age 3-10, but all are welcome to participate and fill their treat bag with fun prizes. Visit the picture booth for a memorable keepsake photo opportunity with our local photographer and keep an eyeball out hilarious family contests like the doughnut on a string competition or parent-child mummy challenge! For the younger crowd, check out the Haunted Hallways of CCV on the ground floor of the Emory Hebard State Building from 11:00-1:00PM. Move from classroom to classroom and with a knock on the door, you'll find a different surprise every time! 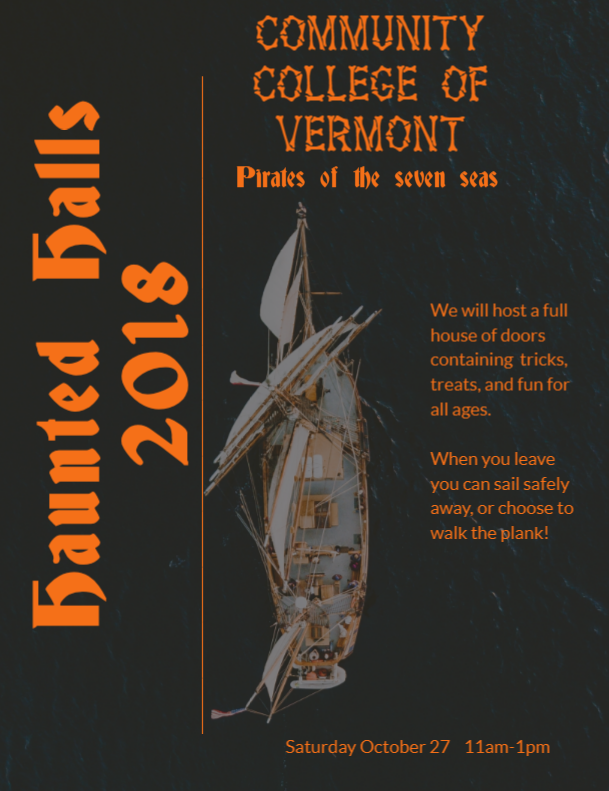 Community College of Vermont is providing free snacks, candy and hot apple cider, coloring activities for the kids and plenty of boo-tiful jack-o-lanterns! Each year downtown Newport crawls with hundreds of witches, vampires and monsters on Halloween. Main Street businesses and organizations see as many as 750 trick-or-treaters in a few hours! With their support and participation, we have a safe place for our kids to participate in a favorite Halloween tradition. If you plan to attend, please consider supporting the event with a donation in advance.